Tank is delivered beside vehicle and trailer - where vehicle can be reversed to. All delivery vehicles are typically a combination truck and trailer - which may exceed 19 metres in length. The turning circle of such delivery vehicles is 20 metres. Site Access: Tanks are unloaded at the closest convenient location beside vehicle. It is the purchasers responsibility to ensure there are no obstructions for the delivery person to gain access to site. Clearance must suit your tank's dimensions. Crusher Dust - A 100mm crusher dust bed is an ideal base. Ensure the crusher dust is 300mm wider than the diameter of the tank and that the crusher dust cannot be eroded from under the tank. ie. direct overflow away from the tank. 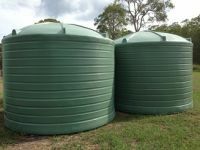 Concrete - Tank may be sited on a level concrete slab slightly wider than the diameter of the tank. Stand - Only tank stands with a hardwood decking spaced no more than 10mm apart should be used. Bearers must have sufficient strength to prevent deflection when tank is full. Ensure the outlet pipes are well supported and are not dependent on tank wall for stability. A 30cm flexible section of pipe should be installed after the gate valve to absorb movement and protect the tank and fitting.